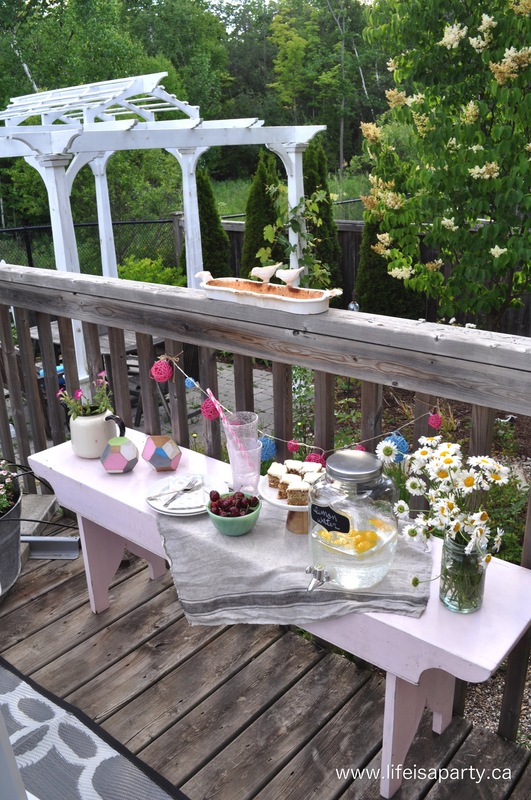 Today I’m sharing my Summer Deck Makeover for the Canadian Bloggers Summer Patio Tour. Earlier this spring my poor old deck was looking a little rough, and a little barren. Everything has to get packed up and put away for cold Canadian winters, so in spring, after the rain, it’s time to bring it all out again. You can see in this “Before” shot, the chairs and little bench are out, but that’s about it. My girls had been playing with their water table, and there were some very dead pansies in some containers. Time for some sprucing up for sure! I started out with the pretty rug. 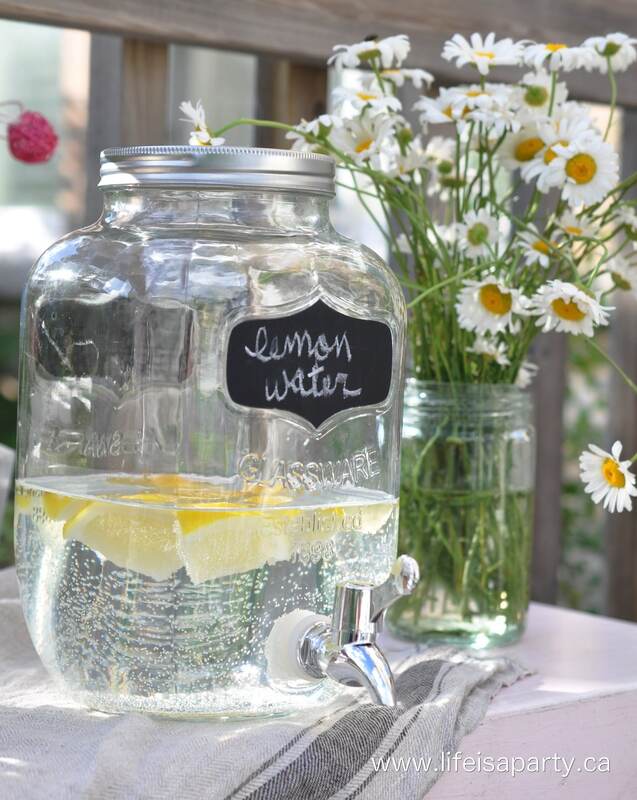 I shopped around for an inexpensive one, since in my experience, they only last one summer. I love the subtle pattern, and the grey colour, and it’s so soft underfoot. Next we moved our umbrella from the back corner. We found that when we want to sit out the sun is on the far side, and it didn’t really provide much shade where it was located. It’s much more usable now. The chairs we bought to mark our very first wedding anniversary(15 years and counting) -well these are actually their replacements. 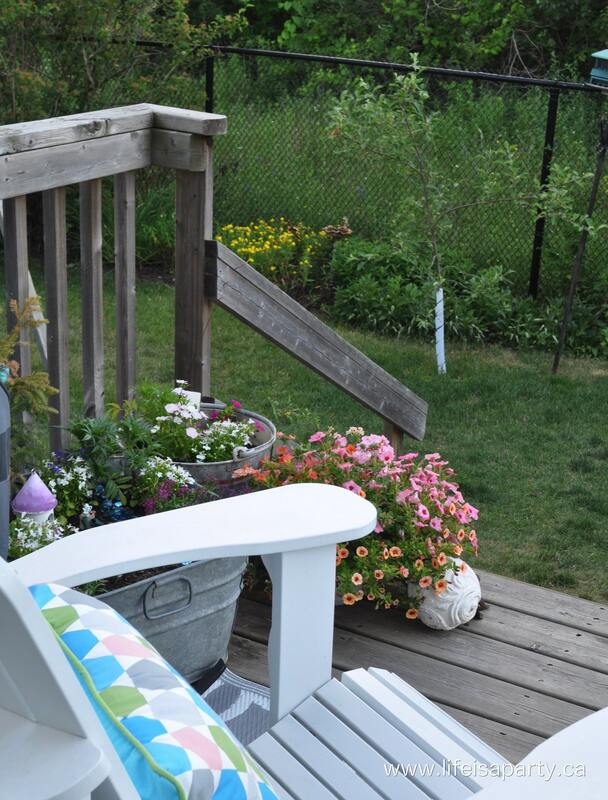 We had wood Muskoka chairs originally, but over the years, and a few coats of stain, they had definitely seen better days. Two years ago my husband convinced me to replace them with these zero maintenance ones, and they have been great, and I’ll never have to worry about restaining or decay with them again. New for this year are the pretty cushions. I like pink, and it hasn’t been around for a few years, so when I saw these with a little pink, and the trendy geometric pattern, I thought they’d be a nice addition. They’re made for outside, so if I forget to bring them in one night, it’s no big deal. I love the colours they bring in and how they help update some of the older pieces. The little pink bench is one I’ve had for years. It’s so handy here, it can be extra seating for a party, or a serving area -great for a few summer refreshments. There’s nothing better on a hot summer day than a bowl of cold cherries. 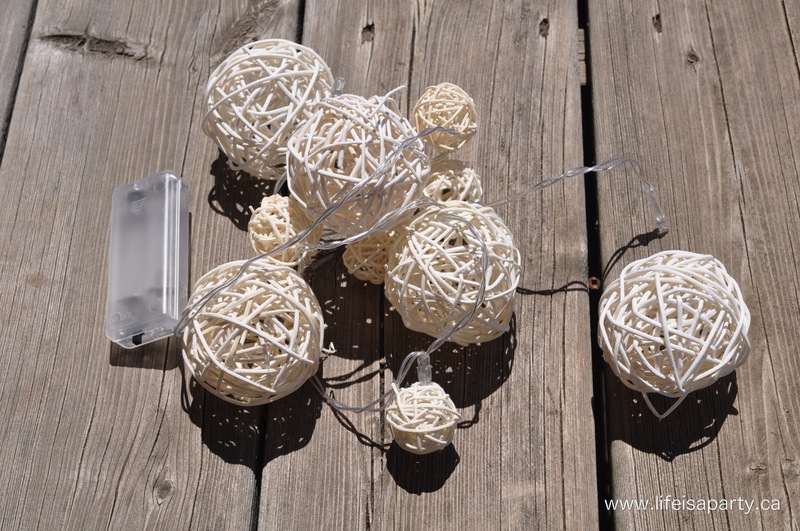 I was inspired by the colours in the cushions to add some colour to the string of lights. 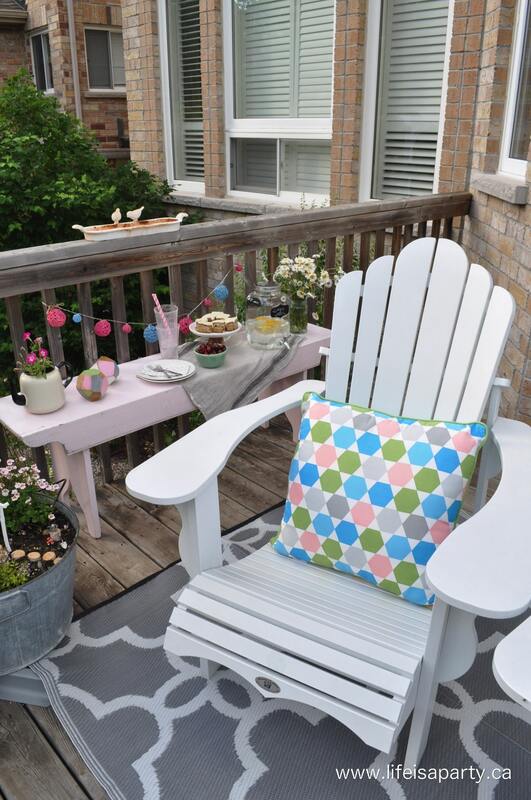 I picked up an inexpensive string at the dollar store, removed the rattan balls, and spray painted them with some left over pink and aqua paint to match the cushions. They’re so pretty at night, and a pop of colour in the day. The cushions and their colours also inspired these fun geometric wooden blocks. 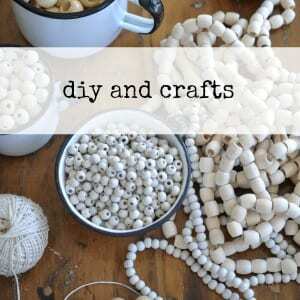 They’re made with some fence post off cuts. My brother-in-law made them for me by sawing off the edges to create the geometric shapes, I painted them to match the cushion colours, and gave them a coat of mod podge to seal them. 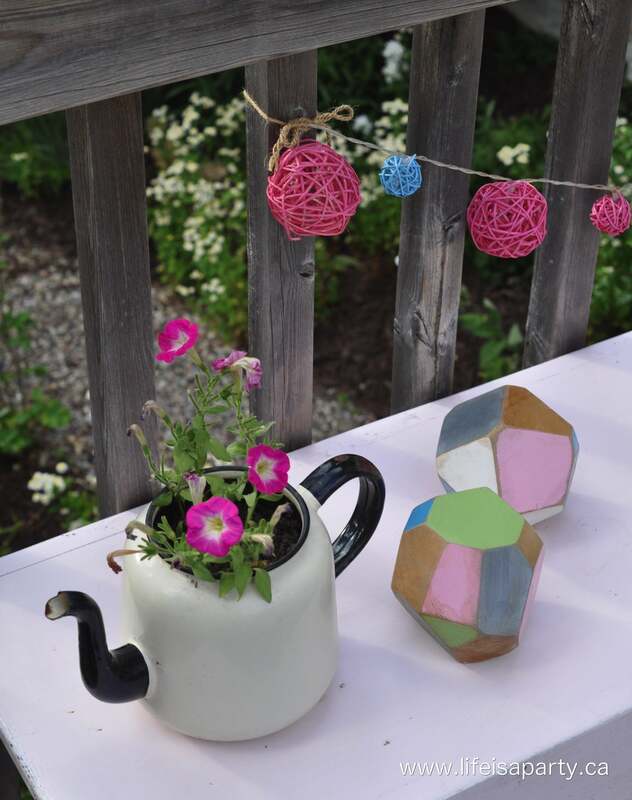 I love the mix of the modern geometrics and the old thrifted teapot with flowers. Down the stairs I added more pots of flowers. 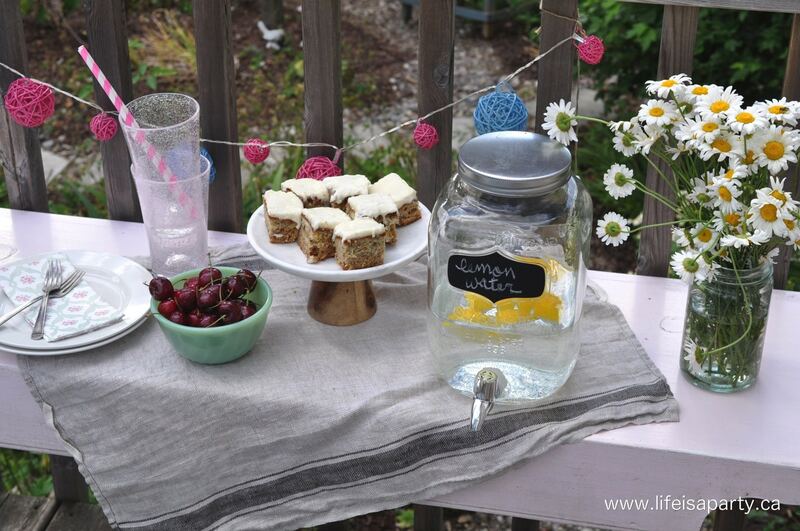 I love using vintage containers for flowers, just be sure to add some holes in the bottom for drainage. And, if you look carefully at these pots, you might notice that I have fairies living in my garden. There’s a few pretty houses in my neighbourhood. And a new fairy pergola that’s very similar to our grown up version. More details on it coming soon, but here’s a sneak peek. 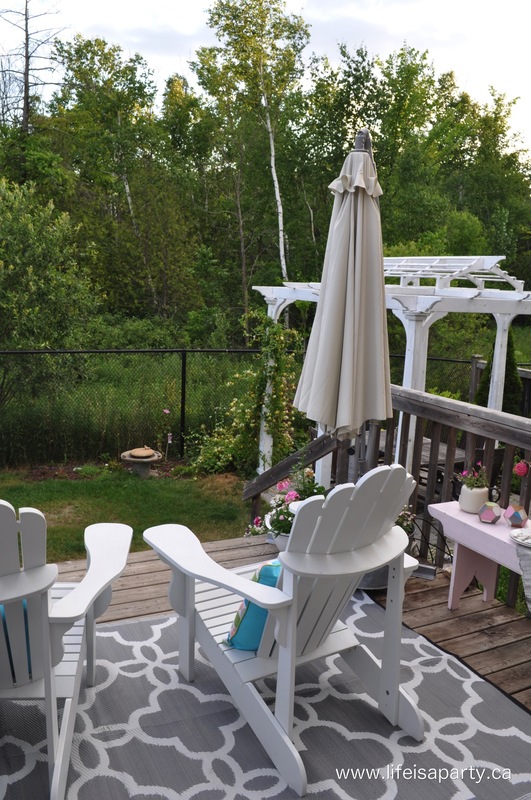 The deck is a favourite spot to sit in the evening and look out on the beautiful forest we have behind our house, and I’m so glad that I invested in a new rug and pillows, did a few DIY’s, moved the umbrella, and planted the pots. I’m looking forward to a summer of enjoying it all. 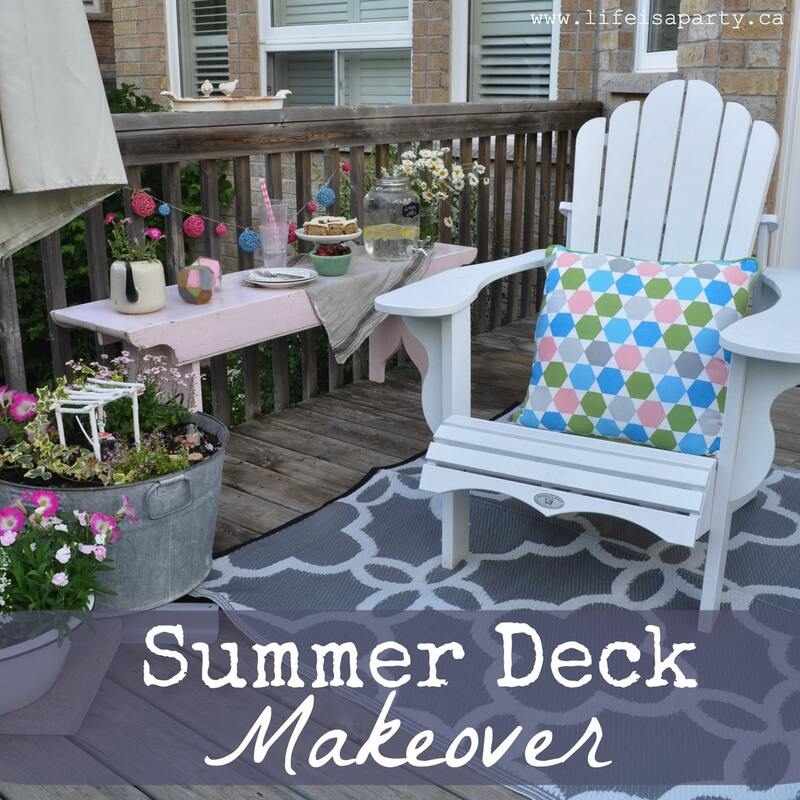 With a Summer Deck Makeover to enjoy, life really is a party! 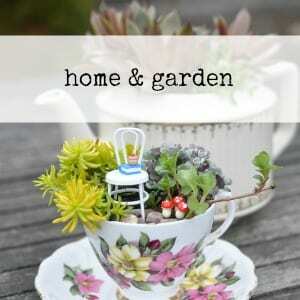 Want to see some more great gardens, decks, and patios? 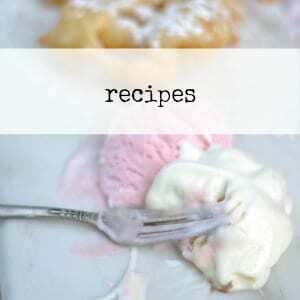 I’m joining some Canadian blogger friends today to give you a little tour! 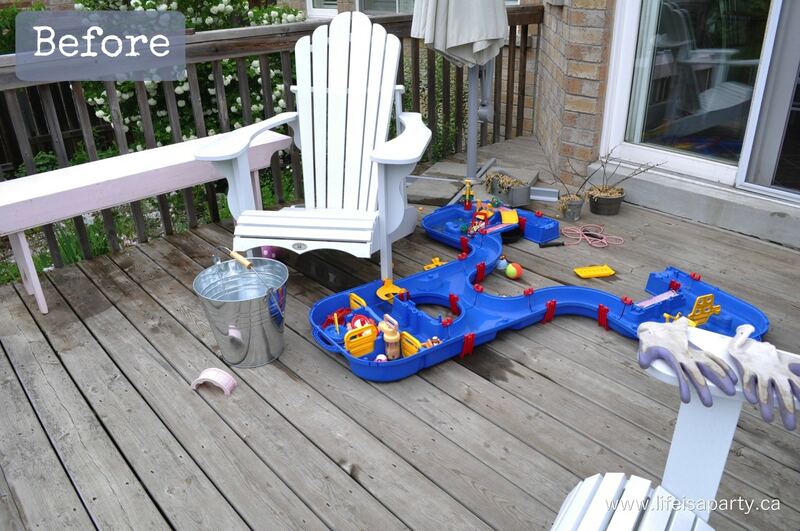 Check out Laurie’s simple patio upgrades – Vin’yet Etc. Hi Danyelle! What a gorgeous view from your deck! And I love your spray painted light string! Hope you many hours to enjoy the space this summer. First if all, looks great! Second of all, I love the idea of buying a set of chairs for your anniversary. What a great way to commemorate than by enjoying them together. These new white ones look like they’re great replacements. 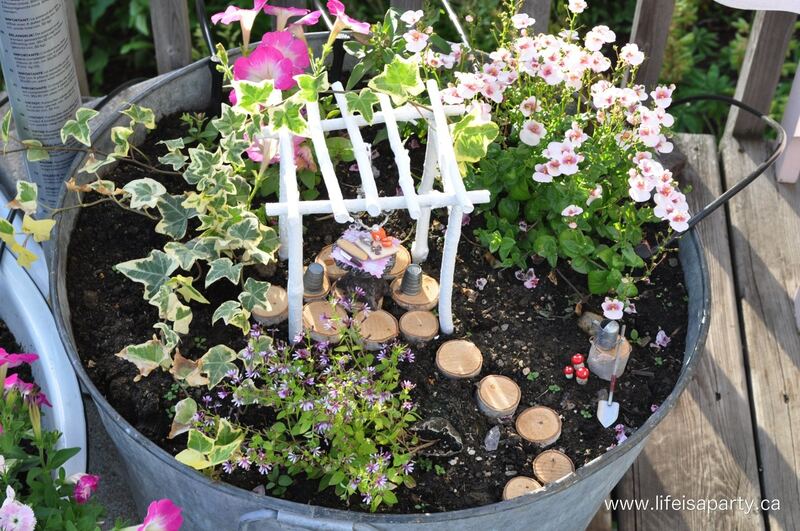 I also like the little fairy garden- very cute! I love that you’ve done with the space! 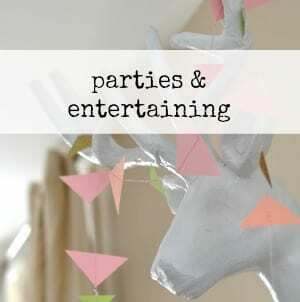 The pops of colour are perfect- especially on those string lights! Where did you get that run? It’s beautiful! Your fairy gardens are absolutely darling, Dannyelle! I love them! 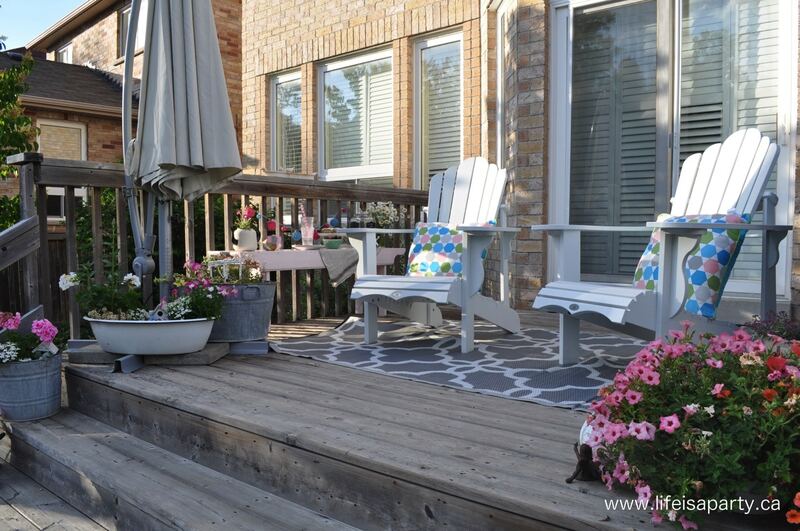 And the colours you used make your deck such a cheery and inviting space. Love it! 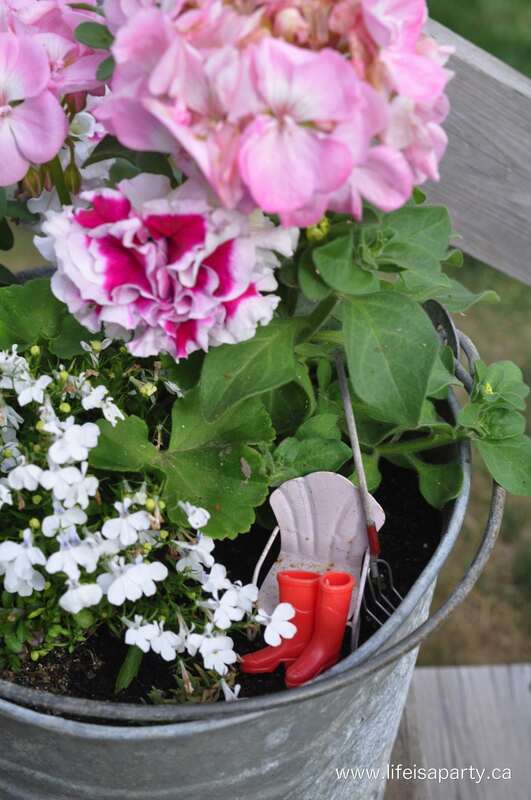 Thanks Tara, it’s fun to be a little brighter outside with colour! Meredith, Thanks so much. I picked up the rug at JYSK, super cheap, and I liked the gray. Thanks Ariel, and thanks for arranging the tour, it was so fun to be a part of! 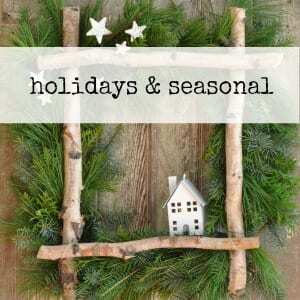 I adore all of your little vignettes! 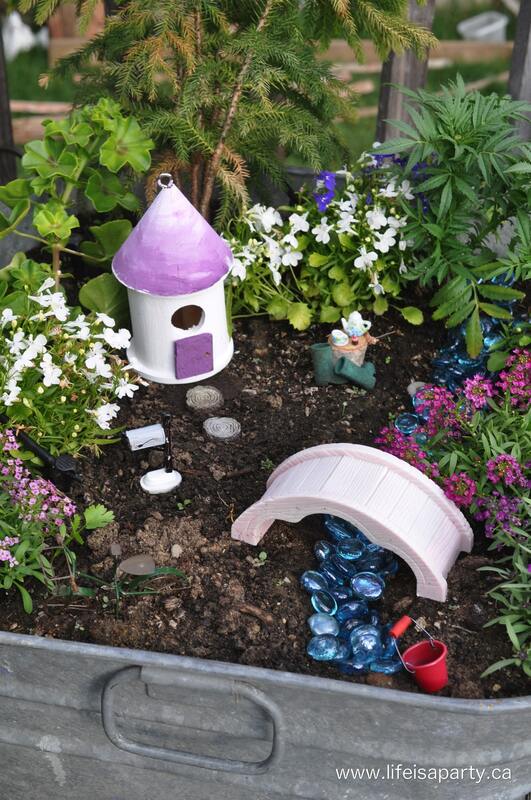 That fairy garden must provide hours of imagination and play for your girls! No puppy shots this time? 😉 I must ask you, where did you get your white Adirondacks, love!? I need to master “stay” with the puppy, lol. The chairs are from Costco. Part of what convinced me to go with them, since they’re made from recycled plastic not wood, is they came with a 40 year guarantee and obviously never need to be painted. Hope this helps.